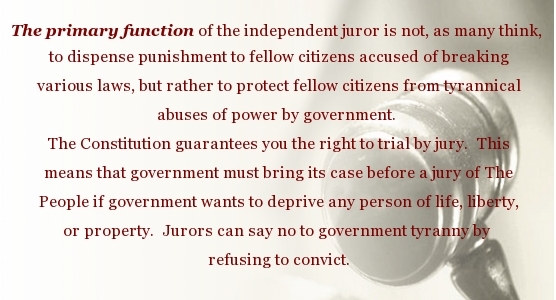 Understood properly, one of the most powerful tools in the hands of We The People is our participation in Jury duty. The case commemorated is Bushell’s Case, 6 Howell’s State Trials 999 (1670). This case is a good beginning for tracing the roots of a legal doctrine known as jury nullification. The year was 1670 and the case Bushell sat on was that of William Penn and William Mead, both Quakers, who were on trial for preaching an unlawful religion to an unlawful assembly in violation of the Conventicle Act. This was an elaborate act which made the Church of England the only legal church. The facts clearly showed that the defendants had violated the Act by preaching a Quaker sermon. And yet the jury acquitted them against the judge’s instruction. The Conventicle Act was nullified by the jury’s not guilty verdict and the infuriated judge fined the jurors and jailed them until such time as their fines should be paid. Bob Smilie is Texas representative for FIJA. He had a booth at G. Edward Griffin’s Red Pill Expo in Spokane, Washington, in June of 2018.